This was one of my favorite devices. 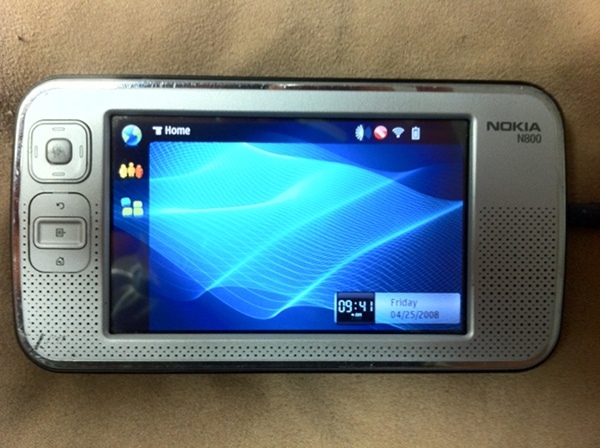 I first ran across Maemo (the Debian-based operating system it runs) when a friend showed me the Nokia N770, the first in the Nxxx series, while Geocaching. It was running an open linux system in the palm of your hand! Back then, the PDA OS du jour was Windows CE variants and Palm OS. It was my first introduction to the platform and I had never heard of any other PDA with a linux distribution on it that we can easily gain root to by opening the shipped terminal on the device and simply typing “sudo gainroot”. This was several months after the N800 released and around the day the Nokia N810 was announced (the device in the series after the N800). The moment I got home, I researched it further online and bought it a few days later. It only took a couple days to arrive and boy was I pumped when it arrived. As mentioned earlier, the Nokia N800 runs Maemo 4 (or Internet Tablet OS 2008 as Nokia liked to term it back then). It originally shipped with Maemo 3 but with an update, you were able to bump the platform up to 4, then eventually 4.1. Maemo 1 and 2 were Nokia N770 releases exclusively, roughly released in 2005 and 2006 respectively. Of course, all this information you could look up on Wikipedia, so I’ll skip over that stuff. Why did I like it? Well, it meant I could pretty much run any Linux application I wanted to–for the most part. It had to compile for ARM, but that just meant that I could load the sources onto the device and use gcc to compile it on the device itself. Anything UI related got tricky, and I often depended on other users packaged bundles for that part. Nokia encouraged the community to develop applications (and for the most part, unofficially port existing applications over that would be a little muddy if Nokia offered said applications officially). More often than not, if you really wanted an application working, or try to find if a popular application existed, you could just head to the Internet Tablet Talk Forums and either do a search, or post asking for what you’re looking for. Sometime since I acquired the N800, the InternetTabletTalk forums seemed to have been picked up Nokia themselves and became part of the official Nokia forums. So what did I primarily use the device for? It made for an excellent SSH/telnet, VNC, rdesktop, nmap (among other networking utilities) device for work and home. I’d be able to carry this device around places where simply a laptop was way too cumbersome to bring, and Of course, the occasional run of Doom, Quake, Quake 2 never hurt. The device was extraordinarily useful when I was in Australia for a few months. I was able to walk into a State Library of Victoria in Melbourne, sit on the side on a couch in a noisy part of the library, connect the device to free WiFi, and then Skype out to call back to the States. The desks and provided computers were always full, and a laptop was sort of cumbersome if you weren’t at a desk. I never utilized e-mail on the N800, mostly because the device had issues connecting to the two Exchange mail servers I’ve tried connecting it to. Plus, the device didn’t have compatible VPN features at the time with the network I would’ve needed to access. It had great on-site uses though. In my opinion, the device excelled due to it’s unique position in the PDA marketplace among the available platforms–but only with hobbyists who actually understood what the device was. The normal user wasn’t really going to go out and pick one of these devices up, especially since phones with “similar” feature sets were making their way out of the door. Hence, not many people know this device, or Maemo, exists unfortunately. People enjoy making comparisons to the Apple iPhone when talking about anything in 2007 but the iPhone didn’t start eating heavy marketshare until the iPhone 3G was released with App Store support in the summer of 2008. Since acquiring the N800, I currently have in my possession the latest (and possibly the last) device in the series, the Nokia N900. It is now one the devices I make sure to carry in my backpack all the time, among many others. The significant newest feature of this device is that it supports 3G, so you’re really never left without an Internet connection. Many other improvements have been made, but you can find all of those on the linked wiki. This post is really preparation of the many posts I’ll be doing in the future on MeeGo running on the Nokia N900 (and possibly other devices), which is the merge of Maemo with Intel’s OS Moblin. Maemo 5 is the last release of Maemo, and the work done on Maemo 6 has been merged into MeeGo.